“Redemption” picks up from where “Revelation” left off and Erica Hayes gives us two characters who are disgraced due to what they did in their pasts and keep doing in their present. Japheth, otherwise known as one of the Tainted is trying to redeem himself and by redeeming himself, he hopes to make it back in heaven. For him to do that, he must find himself a demon vampire that is wreaking havoc in Babylon and is known as the Angel Slayer. He also must do what the Archangel Michael wants as well, and the demon vampire can actually help him conquer that mission. Although, the demon vampire known as Rose Harley has other plans. She never wanted to be a vampire, but it is kind of hard when the Prince of the Vampires makes her be the way she is. She did the unthinkable when she turned and she has never forgiven herself. When she meets Japheth, she cannot help but try to keep her feelings at bay with him. He is much different than other heavenly warriors. Japheth is supposed to kill hellspawn like Rose, but he cannot. He uses her to help him find her master, but he also is trying to convince himself that she can be helped. In the meantime, the other Tainted are tackling another demon who has a vial and if they do not get it, they will have even more trouble on their hands. This is a story of two characters who are trying to redeem themselves but in different ways. They are trying to fight their feelings for each other, but it is kind of hard when they are so much alike. Erica Hayes gives you a world of warrior angels that are protecting Earth from the demons taking over. Although, their job is never easy, especially when some of the warriors believe their boss may be letting the demons run the course without being taken care of fast enough. Rose was such an evil character at first, but when her story came out, she broke my heart. The poor girl had done the unthinkable and I believe she definitely needed to be redeemed. She even put Japheth in his place several times, which made me love her more. The only thing that kept me from giving this book even more moons was that it started off slow, but when it started picking up, I was turning the pages to find out what happened next. The oh…the ending is the doozy…because I have no idea what to think about two characters now…Michael and now Gabriel, who plays a minor part in this book. I’m a little confused, but to me, that is a good thing. The very ending had me in shock though. I had my mouth open in shock, literally. Erica, I was definitely not expecting that at all. I give this book 4 full moons and highly recommend it to urban fantasy and paranormal readers out there. 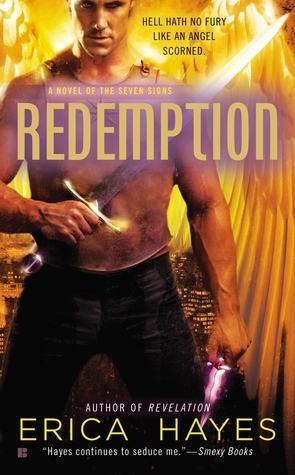 “Redemption” is full of action, sexual tension, and darkness that will keep you turning the pages. Will the warriors win or will the demons take over the Earth? I received a complimentary copy of the book as a part of the blog tour in exchange for an honest review.